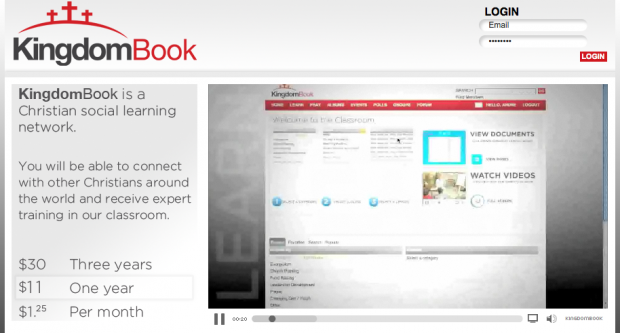 KingdomBook.com just passed my inbox and I thought I’d take a look, except I quickly found out via their front page that it’s not free, and even though they offer a 2 week trial period I think the video (embedded below) showed me enough of what I’d experience. It’s an interesting play with the addition of “learning” and education and it appears that they have an additional monetization strategy with their product placements on the sidebars (and this is in addition to their pay per use model). Too bad. I think they could have made this free and still made some cash. Why not tie into facebook and engage culture instead of drumming up another way to take money from people for their supposed "meet other christians". I have to agree with hsojeel, and the "prayer network" initially sonds incredibly ineffective. how would you make it profitable without charging up front? How are they going to expand their user base to any profitable level if they are charging up front? I just don't see this business model succeeding. Winner: Adobe Creative Suite CS3!